thom kubli begins work at tesla on his new project global contentifier. in an open studio, he presents sculptural elements and drawings which convey the idea of the project. the work describes a kind of wish-machine for political matters of every kind, which is conceived as a sculpture for the urban sphere. the extension of the sculpture into software on the internet creates the possibility for a global intervention. after completing the max/msp programming, he begins an active test phase, with audience participation via website and telephone interface. 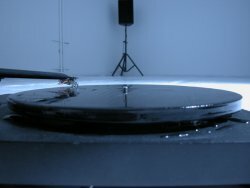 frozen records II is an open laboratory situation and a slowly developing installation of played ice records with trautonium sounds, in which the artist wishes to explore the tone quality of frozen water. refrigeration appliances, record players, molds and playback equipment are part of the acoustic-spatial production. sketches, photographs, and formulas on the walls offer deeper insight into the work.